This series is meant to paint a realistic, well-sourced and objective portrait of American health care early in the 21st century as compared with that of our 29 partners in the Organization for Economic Cooperation and Development (OECD, all of us comprising the most developed democracies in the world), and to examine how workers’ compensation fits into that mix. We’ve done a lot of the former and some of the latter. Now it’s time to finish the job. American per capita health care spending is two and a half times the average in the OECD and 25% higher than our closest competitor, Switzerland. American per capita health care spending on pharmaceuticals is double that of the average in the OECD. We perform more sophisticated testing and surgeries than any other country. Our physicians earn double the compensation of their OECD counterparts. Our hospital stays are 25% shorter and our doctor visits 42% fewer than other OECD citizens. Despite all the spending, we don’t live longer and are no healthier than the average among OECD countries. There has been explosive growth in the incidence of Type 2 Diabetes, much of it caused by an epidemic of obesity, and 27% of the per capita increase in our spending on health care since 1987 is attributable to obesity. At nearly 31%, the percentage of obese adults in the US is the highest in the OECD and 25% higher than Mexico, the country that wins obesity’s OECD silver medal, yet we been unable either to halt or reverse the growth of obesity in America. Thirty-one percent of our total health care expenditures go toward insurance administrative costs, far more than any other OECD country. Since 1996, worker’ compensation medical treatment costs, representing only 3% – 4% of total US spending on health care, have been rising at twice the rate of those sharply and steadily rising group health costs. We spend significantly more to treat worker injuries than similar injuries in group health, principally because of over-utilization of medical services. Pharmaceutical costs, representing 18% of total incurred losses at the fifth service year, are a large chunk of the ice beneath the water line, the costs that are often hidden and unknowable (When have you ever seen prescription drugs itemized on a loss run?). If you are an employer, ask yourself these questions: Do you have any idea of the prescription drugs your injured workers are taking? Do you have any idea of the extent to which your injured workers are being prescribed narcotics, such as OxyContin, Actiq, Fentora, Duragesic, even Vicodin? If not, you need to have an immediate talk with your insurer and your Pharmacy Benefit Manager. It’s that important. None of us can do much about the ridiculous costs of health care in America today. To quote Hercule Poirot, the problem is “a many-headed Hydra.” But employers and insurers can do something about the ridiculous costs of health care in workers’ compensation. What, you say? Conclusion: medical costs grow as indemnity costs grow, because injured workers stay out of work longer than is medically necessary. The modest proposal: A caring, aggressive, systemic, performance-oriented and measured program that focuses on a) preventing injuries from occurring in the first place and b) if injuries do occur despite your best efforts, bringing injured employees back to work in some medically approved capacity of temporary modified duty as quickly as possible. This early return to work will keep injured workers connected to the workplace and the ingrained routine of getting up, getting dressed and going to work every day. Absent that, the injured worker will stay at home where he or she will create a new routine of staying out of work and making up his or her own, stay-at-home modified duty program. If I were injured and could not go to work because my employer had nothing for me to do, that’s what I would do, and so would you. And that does not have to happen. It’s a lot of work, but it’s as simple as that. I’ve enjoyed writing this series. I hope it’s given you something to think about. There’s a brouha brewing in England, where a civilian employee of the Ministry of Defense (MoD) has been awarded 202,000 pounds for straining his back while picking up a printer. In this country, $350K+ awards are not all that unusual for (serious) back injuries, but the British tabloid press has jumped all over this story, comparing the generous benefits to those awarded seriously injured soldiers returning from the Iraq war. The Telegraph cites Pvt. Jamie Cooper, who was just 18 when hit by mortar rounds in Basra in November of 2006. (He is the youngest British soldier to be injured in Iraq.) He suffered internal injuries, a shattered pelvis, his leg was damaged and he lost the use of a hand. Payment for his troubles? About 57,000 pounds. A spokesperson for MoD points out that Cooper received not just the lump sum award, but also a “guaranteed tax-free, 9,000 pound a year for life – 60 percent of his final salary.” True enough, but the “salary” of a soldier is rather piddling when compared to jobs in the open market. It is ultimately futile to compare the world of ordinary work with war. Were the actuaries to calculate a workers comp rate for an infantryman in Iraq, the numbers would dwarf those for our most dangerous occupations – ironworkers, lumberjacks and fishermen. In the ordinary working world, steps can be taken to control risk. In war, risk is rampant and beyond control. Your goal is simply to survive the day. In a way, it’s like looking at the world through binoculars: the first time, you get a magnified image: the suffering of an individual really seems to matter. If you turn the glasses around, everything is suddenly diminished. War has a way of making the pain and suffering of individuals fade away to nothing. When we read that an RAF typist who injured her thumb was awarded 484,000 pounds, or another civilian employee was awarded 217,000 pounds for chronic fatigue syndrome and depression, we shrug. That’s just the disability system operating in its usual and customary fashion. But when you compare these generous benefits to those given to the shattered veterans returning from war, shrugging is insufficient. It is an outrage. It makes you shake your head with a combination of wonder and dismay, even as you stir in a bit of honey to sweeten your morning tea. Ernesto the Insurance Geek is hosting this week’s Cavalcade of Risk at InsuranceYak.com. He has sifted through a whopping 18 submissions, thereby providing easy access to anyone with an interest in risk – and that is just about all of us. Check it out. If you are a corrections officer on leave for a workers compensation injury, you should probably avoid getting dressed up in drag and competing in a public 40-yard dash, running in high heels. Nor should you work two other jobs while collecting workers comp benefits due to your inability to work. Come on people, you will have to do better than that – this is the work of fraud amateurs! There is no shortage of resources for how to bilk your boss on the web, but many of them sound rather dubious. How to fake an injury is outright lame, but there is a little more thought put behind How to call in sick when you just need a day off – right down to short how-tos for creating illness sound effects. This would probably not faze your average HR director – they’ve heard everything. Every year, CareerBuilder does a survey to learn the worst sick day work excuses for the year. Forbes has an interesting slide show “Yeah, Right on the topic of work excuses. There are probably few among us who haven’t taken a day or two here or there in the course of our careers, but there are some “excuse-mills” online who are upping the ante a bit. These are vendors who provide templated excuse letters for doctor visits, jury duty, and the like. For $24.95, My Excused Absence offers a series of templates, including an emergency room visit and a medical evaluation form. Of course, these are “for entertainment purposes only.” Phoney Excuses bills its products as “novelty excuses.” You can get a doctor’s note for $19.95 and the site offers explanations of the “legal aspects of a doctor’s note” and how doctor’s notes are important in workers comp, disabilities, or SSI. Fake Doctor’s Excuse are a bargain in comparison, only $9.95. They suggest their notes are for entertainment or novelty only, and might be suitable for framing. You can hang one in your cubicle. These forms sound pretty bogus to us – somehow the people who rely on them sound like also they might be the type of people to dress up in drag to run a high-heeled road race while out on disability. Fraud is no laughing matter – it costs money for all the honest folks. Plus, in most jurisdictions, it is a felony. That being said, we’ve always found that estimates of worker fraud in workers comp are usually overblown. While there is indeed premeditated fraud and employers and insurers would do well to be vigilant and prosecute it vigorously when found, we find more abuse that falls in the category of malingering. An injury did indeed occur, and after time, the worker may fall into disability syndrome. It has been our experience that employers who have a good workers comp program encompassing both injury prevention and point-of-injury and post-injury management aren’t as susceptible to fraud as those who don’t. Don’t adopt a suspicious approach. Did you ever have a teacher who made draconian rules for your entire class just to punish one or two bad apples? Those of us who did all resented it. Don’t build punitive or mistrustful programs to defend against the few bad apples in your workplace and risk alienating the vast majority of good people who work for you. Be fair, open, consistent, and honest. Treat the bad apples as exceptions not the rule. Explain the rules. Make workers comp a part of your orientation program just as you would any other benefit. Most employees (in fact, many employers) don’t understand what its purpose is or how it works. Better you explain it than the daytime or late night TV lawyers. First, explain your safety policies and your expectation that these will be followed diligently. Then explain what will happen should an injury occur. Explain how the benefits work and about your return to work program and your intent to take the best possible care of any injured workers. At the same time, note that fraud is a felony and will be aggressively prosecuted. If there are any professional fraudsters, they may move on to an easier target if you alert them to your tightly managed program. Stay connected. If an employee is out for more than a few days for an injury or illness, stay in good communication. Be supportive and let the employee know you value them and want them back on the team. Establish goals for return to work. Conduct accident analyses on every accident. It’s important to know what happened so that you can prevent future similar accidents. We use the term “analysis” rather than “investigation” intentionally – this should not be about blame, but about establishing the facts of the event and learning how to keep other workers safe. Train your managers to be alert for red flags that might indicate fraud and, if found, alert your insurer. But the single best tip for preventing fraud? Be a great employer who earns the respect of your employees. The Coalition Against Insurer Fraud has links to insurer fraud bureaus, as well as a variety of other resources and organizations. Fresh wonkery – A fresh new edition of Health Wonk Review – the “fearless leader” edition – is hot of the presses at Joe Paduda’s blog, Managed Care Matters. As the original mastermind behind HWR, Joe has more than earned that nickname. This week’s edition focuses on reform – a continuing theme this year – as well as pharma & technology, electronic records, and a few items listed as “not categorizable.” HWR continues to be a worthwhile gathering of some of the smartest minds in the health care policy arena. Slip and fall research – An article in Occupational Hazards notes that when it comes to falls, most attention is devoted to falls from heights, yet same-level falls are common, cause injuries, and can even result in fatalities. Safety researchers from Liberty Mutual have been conducting studies on same-level falls and looking at a variety of contributing factors, including flooring choices, conditions of walking surfaces, foot protection and employee perceptions of slip hazards. WC and the price of gas – With gas prices skyrocketing, we are noticing a few news items about mileage reimbursement for claimants. Atty. 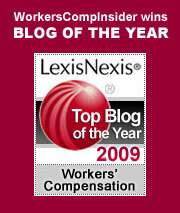 Nick Avgerinos notes in his blog that in the early years of his practice, Illinois workers’ compensation law clients never made inquires concerning reimbursement for mileage to and from their own doctor or physical therapist, but now with the price of a gallon of gas approaching $4, the question is cropping up frequently. We also noticed that Connecticut recently announced a schedule of mileage reimbursement rate increases for workers comp claimants. Not so exclusive a remedy – Except in unusual cases, workers comp protects employers from being sued for injuries that occur at work. But apparently a “homemade” version of workers comp carries no such protection. Business Insurance reports on the case of Carl Smith who crushed his hand at work. His employer, Desautels House Movers Inc., did not have workers comp insurance and paid for benefits out of pocket. But because such an arrangement has no “exclusive remedy” provisions and the employer did not have Smith sign a waiver, Vermont’s Supreme Court ruled that Smith can proceed with a negligence suit. Drug testing – The talk on some employment law blogs this week is a court ruling late last week that put limits on the rights of a public employer to require pre-employment drug testing. The San Francisco Chronicle has the story, and then go visit Workplace Prof Blog for some thoughts on the matter. Veterans – On the fifth anniversary of the start of the Iraq war, Liz Borkowski at The Pump Handle has a roundup of news stories about veterans and the disabilities and issues they are facing when they return home. The Best Health Care in the World – Part Four: Do the Statistics Tell the Whole Truth? But not all the news is gloom and doom. We lead the world in medical technological innovation, and we have chosen to target this expensive technology at some very thorny problems. Further, statistics don’t always tell the whole or true story. Sometimes, one needs to lift up the rug and check what’s lying underneath. Take infant mortality, for example. The best place to find infant mortality data is (drum roll): the US Central Intelligence Agency, which tracks the rate of infant deaths in 241 countries around the world in its World Facts Book. Currently, the CIA shows Angola, with 184 deaths per 1,000 births, as having the highest infant mortality rate (IMR) in the world, 241st out of 241. That is, more than 18% of Angola’s infants die shortly after birth. In fact, with the exception of Afghanistan, the 24 countries with the world’s highest infant mortality rates are all in Africa. It has long been known that IMR directly correlates with a nation’s per capita GDP. At the other end of the scale, Singapore, a high-GDP country, ranks first, with the world’s lowest infant mortality rate – 2.3 deaths per 1,000 births, followed by Sweden, Japan, Hong Kong, Iceland and France. And where in this mix is the United States you may ask. Well, with a rate of 6.37, we rank number 41 in the world. Or do we? It all depends on how one treats the numbers, because not everyone defines infant mortality the same way. The most common definition is: the number of deaths of infants, one year or younger, per 1,000 live births. The question is – what is a live birth? The World Health Organization (WHO) defines a live birth as “any born human being who demonstrates independent signs of life, including breathing, voluntary muscle movement, or heartbeat.” However, the United States counts all births as live if they show any sign of life, regardless of prematurity or size. This includes what many other countries report as stillbirths. And the US is far more aggressive and advanced in attacking and treating significant neonatal complications. Visit any major teaching hospital’s neonatal ICU and you’ll see what I mean. The inference is that the US’s actual comparative infant mortality rate may actually be lower, perhaps much lower, than is statistically reported. But those neonatal ICUs cost a lot of money. It’s an investment the US has chosen to make, unlike most other countries, and it is symptomatic of why we spend so much more than the rest of the world on health care. Of course, if you spend a few minutes talking with a mother and father who have just brought a young child home, healthy and smiling, after six months, of so, in one of those expensive, neonatal ICUs, you might be excused for thinking, as they surely do, that the cost is worth every penny. Part Three: What Do We Get for the Money? Part Two – What does it cost? The Best Health Care in the World – Part Three: What Do We Get for the Money? In Part One of this series, we began looking at some of the many cost disparities between group health and workers’ compensation. In Part Two, we compared US health care costs with costs in the other 29 member-countries of the Organization for Economic Cooperation and Development (OECD). OECD countries, all democracies, are considered the most economically advanced in the world. We saw that health care spending in the US is a breathtaking 250% greater than the average for all of these developed democracies. Moreover, as measured by Gross Domestic Product (GDP), health care made up 15.3% of the US economy in 2004 – up from 5.1% in 1960 – nearly double the rest of the OECD. 1. Do we live longer? 3. What other factors could affect how the health of US citizens compares with OECD citizens? Do we live longer than people in other OECD countries? Simply put, we spend a lot more on healthcare than all other OECD countries, but don’t live any longer for the money. In fact, we live shorter lives than most. As of 2004, average life expectancy at birth in the US was 77.5 years, which ranks 22nd out of the 30 OECD countries. While this is slightly below the OECD average, it is four and a half years less than top-ranked Japan. Also, it may surprise readers to learn that life expectancy is two and a half years longer among the people of our neighbor to the north, Canada. And, despite all the editorial bashing of the UK’s National Health System, its citizens outlast us by a full year, while people in Spain, France, and Italy live, on average, more than two years longer than we do. For all the money we spend on healthcare one would think we enjoy Olympian health, but this does not appear to be the case. Although it pains me to write this, I can find no peer-reviewed studies that conclude that we are a healthier people than our OECD neighbors. The OECD provides specific disease incidence data in two areas: cancer (malignant neoplasms) and acquired immunodeficiency syndrome (AIDS). In both cases, the US has the highest rates in the OECD. The incidence of cancer in the United States is 34% higher than the average within the OECD (358 cases per 100,000 people versus 266). With respect to AIDS, the US incidence is an astonishing 675% higher than the rest of the OECD (147 cases per 100,000 people versus 19 in the OECD). Our mortality rate due to AIDS ranks second in the OECD (4.2 deaths per 100,000 people, well behind the staggering rate of 8.6 in Portugal). Yet our mortality rate for cancer ranks only 14th among OECD countries. What about obesity, reputed by many to be epidemic in the US? With the exception of the UK and the US, which get their obesity statistics by actually measuring people, OECD countries get their results from surveys, so the only fair comparison is the US versus the UK. In 2004, while the UK’s overweight population was 14% higher than that in the US, our obese population was 39% greater. On the other hand, the US rate of alcohol consumption and incidence of daily smoking were both lower than the average for OECD countries (daily smoking in the US is the third lowest (17%) of all OECD members). Unfortunately, obesity has been shown to be a greater driver of health care and health care spending than alcohol consumption or smoking – “the effects of obesity are similar to 20 years of aging (PDF).” According to Thorpe, et al, (The Impact of Obesity on Rising Medical Spending (PDF), Health Affairs, 20 October 2004), 27% of the per capita increase in US health care spending between 1987 and 2001 was attributable to obesity. There is a direct correlation between obesity and Type 2 diabetes and obesity and hypertension. Is it any wonder that in the last thirty years Type 2 diabetes and hypertension have seen explosive growth in the US? What other factors could affect how the health of US citizens compares with OECD citizens? 1. The age of our population – While this will be a concern in the immediate future as baby boomers grow older, currently 12% of the US population is older than 65, which is below the OECD average of 14%. 2. Income and insurance – The US is unique in the OECD, because it does not have a national insurance program. About 60% of us are covered by some form of employer-provided insurance. Another 26% are covered by Medicare or Medicaid. That leaves 14% who are uninsured in any way. Among this group, most of whom are poor and many of whom are sick, healthcare often goes a-begging, with harmful results. For example, hypertension is less controlled in this group, “sufficiently so that the annual likelihood of death in that group rose approximately 10%.” (Newhouse et al, Free for All? Lessons from the RAND Health Insurance Experiment, Harvard University Press, 1993). Twenty-two OECD countries provide more than 98% of their citizens with public health insurance covering at least hospital and in-patient care. Despite this, Americans spend less out-of-pocket than the people of most other OECD countries – 13.2%. The OECD average is nearly 20%. Studies have shown that when a people pay less out-of-pocket for healthcare, total spending rises. 3. Sophisticated medical procedures – In the movie Pat and Mike, Spencer Tracy famously said of Katherine Hepburn, “There’s not much meat on her, but what there is is choice.” The same can be said for hospitalizations in the US. Although hospital stays are fewer and shorter, a lot of high-powered activity goes on. For example, the US ranks in the top five OECD countries for the rate of caesarean section childbirths as well as all forms of organ transplants with the exception of lung transplants. Moreover, we’re in the top five for all four of the heart procedures on which the OECD collects data. We perform coronary bypass surgery and angioplasties at more than double the rate of the OECD average. Finally, we perform far more coronary revascularization procedures than any other OECD country. Despite performing substantially more invasive heart procedures than all other OECD countries, death rates for heart disease in the US are the 17th worst in the entire group. 4. Advertising – Between 1996 and 2003, pharmaceutical advertising quadrupled. Turn on the nightly news and count the ads for prescription drugs. Only two countries in the world allow this, the US and New Zealand. I find it amazing that more than 75% of the brands advertised had ROIs of more than 50%. Clearly, Americans respond to direct-to- consumer drug advertising, which is one reason why we spend double the OECD average on prescription drugs. How does this all relate to workers’ compensation? We’ve seen that, despite spending more on healthcare than any other country in the world, Americans don’t live longer or enjoy better health than citizens of any other OECD country. But every day, medicine practiced within workers’ compensation depends entirely on the US healthcare “system,” if we want to go so far as to call it that. It’s certainly systemic, but perhaps systemic in a lot of the wrong ways. The Best Health Care in the World: Part Two – What does it cost? In 1992 I became a Trustee of a major, tertiary care, teaching hospital in Massachusetts. For Trustee indoctrination, new Trustees spent a week in a classroom learning about every facet of hospital life. One morning we were briefed by the hospital’s CFO. I was astonished to learn that the hospital had 27 different billing systems, one for each insurer and HMO with which it did business. To me, this was Kafkaesque. I mention it now, because in the intervening years, the situation has become worse, much worse. At 31% of total US health care expenditures, the administrative costs of healthcare providers are double those in Canada (Woolhandler et al, New England Journal of Medicine, August 21, 2003, page 768), and, with the exception of tiny Luxembourg (population 425,000), America’s health administration and insurance costs are the highest of any of the world’s developed democracies. We spend more, far more, than any other country in the world on health care. Do we get what we pay for? In Parts Two and Three of this series on health care, we examine that question. In Parts Four and Five we relate it all to workers’ compensation, at 3% to 4%, a tiny room in the American health care house that Jack built. The US compared with other developed countries: The cost explosion. The United States has been a member of the Organization for Economic Cooperation and Development since the OECD’s founding in 1961 (the forerunner of the OECD was the Organization for European Economic Cooperation, set up under the Marshall Plan in 1947). There are 30 member-countries of the OECD, all democracies, most of which are thought to be the most economically advanced nations in the world. In September, 2007, the US Congressional Research Service, the best research group you’ve never heard of, published a report for Congress titled, “U.S. Health Care Spending: Comparison with Other OECD Countries.” (Abstract , including downloadable full report in PDF.) This 60-page, well sourced report paints a grim, if occasionally confusing picture. Until 1980, US spending on health care, as measured as a percentage of gross domestic product (GDP) ranked at the high end of OECD countries, but not excessively so. In 1980, US spending as a share of GDP was 8.8%, which compared favorably to Sweden’s 9.0%, Denmark’s 8.9%, Ireland’s 8.3% and the Netherlands 7.2%. True, spending in the United Kingdom, at 5.6%, France and Norway, at 7.0%, each, and Canada, at 7.1%, was lower, but no one could claim that the US spending was out of control. Then something happened. By 1990, our spending as a share of GDP had grown to 11.9%, while the rest of the OECD countries remained fairly static – Sweden’s and Denmark’s declined to 8.3%, the UK’s rose to 6.0%, and so on. And by 2003, the US share had ballooned to 15.3%, nearly three percentage points higher than Switzerland, at the time our closest competitor. In fact, in 2004, the OECD average spending as a percentage share of GDP, excluding the US, was 8.6%, just over half of the US share. In the average OECD country nearly 74% of healthcare costs are publicly financed; in the US, less than 45 %. Moreover, per capita health care spending in OECD countries, excluding the US is $2,438; in the US, per capita spending is 250% higher, at $6,102. When analyzing why the US spends so much more on health care, one hardly knows where to begin, because in nearly every category we dwarf the field. Take prescription drugs, for example. Average per capita spending on pharmaceuticals among all OECD countries, including the US is $383, but in the US it is $752, which is $153 dollars per person more than the second largest spender, France. Despite this, because the US spends so much on all of health care, pharmaceuticals account for only 12.3% of total spending, which is near the bottom of the pack among all OECD countries where average spending on pharmaceuticals is 17.8%. One would think, perhaps, that spending is so much higher in the US because we have more hospitalization, or doctor visits per capita, but one would be wrong. Hospital discharges per 1,000 people in the US are 25% lower than the average for all OECD countries, and doctor visits are 42% lower. Well, maybe people have significantly more intense and aggressive service while they are hospitalized in the US? One indicator of intensity is the average length of acute care hospital stay. In the US, the length of acute hospital stay is 5.6 days, which is less than all but eight of the other 29 OECD countries. But shorter stays could mean higher efficiency. A better way to look at it is to look at specific causes for hospital stays, like heart attacks, for instance. The US average hospital stay following acute myocardial infarction is 5.5 days, the lowest in the OECD. Consider childbirth. Here the US has the third-lowest rate of stay, 1.9 days – much shorter than the OECD average of 3.6 days. Another reason for high costs in the US is our aggressive testing. Only Japan has more CT scanners and MRI units per million people. And, although doctors will roll their eyes when they read this, still another reason for our higher costs is physician compensation. At an average of $230,000 and $161,000 for specialist and general practitioner pay, respectively, each of these groups earns more than double their OECD counterparts. That will be the subject of Part Three in this series.